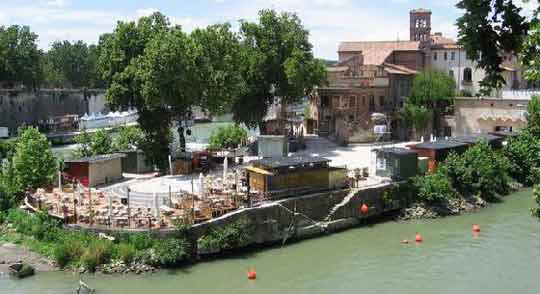 Tiber Island or Isola Tiberina, is connected to the mainland by means of two ancient roman bridges. On the western side, Cestius Bridge or Ponte Cestio, built in the 1st century B.C. connects the island to the Trastevere district. The bridge has been damaged and restored several times due to flooding. In the late 19th century, the bridge had to be completely rebuilt, many of the original parts were used, but the shape of the bridge was altered, in order to fit the new protective walls that had been constructed along the Tiber’s banks. On the eastern side, Fabricius Bridge or Ponte Fabricio, connects the island to the Ripa district. 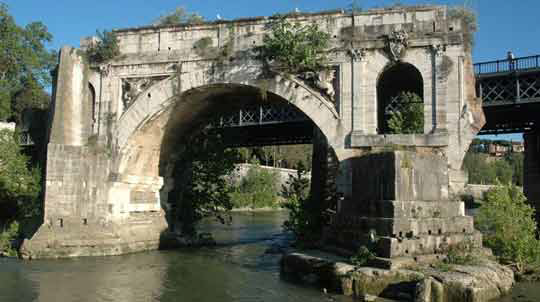 This bridge was built a few years earlier than Cestius Bridge and is the oldest bridge within the walls of Rome. This bridge is often referred to as the Ponte Quattro Capi or Four Heads Bridge, as on each side, a four-headed figure has been carved. These carvings, are not part of the original structure, but were placed there in the late 1500’s, by pope Sixtus V, during a major restoration of the bridge. Records indicate that the island has always had a medical association. The island was once home to an ancient temple dedicated to Aesculapius, the Greek god of medicine, and to this day a hospital is based on the island. In the chapel of the church of Saint Bartholomew, a large cannonball can be seen lodged in the wall where it struck during the siege of Rome in 1849. At the time the cannonball hit, the building was full of people, none of whom were hurt. The cannonball, known as, "of the miracle" was left in the wall as a reminder of the incident. The Church of Saint Bartholomew on Tiber Island, was constructed in the 10th Century by Otto III, but the original building was destroyed by a great flood, and so in 1624 the church was rebuilt. Inside the main body of the church, there are 14 granite columns, and close to the alter can be seen a Byzantine fresco depicting the enthroned Virgin with Jesus. Two wings were later added which housed a Franciscan convent. Just down river stands the remnants of a bridge that is now popularly referred to as the Ponte Rotto or Broken Bridge. Only one span remains of what was one of the oldest stone bridges in Rome. Constructed in 142 B.C. the bridge was largely destroyed at the end of the 1500's as a result of violent flooding.